US, 2002, 114 minutes, colour. Robert Duvall, Kathy Baker, Luciana Pedraza, Ruben Blades. 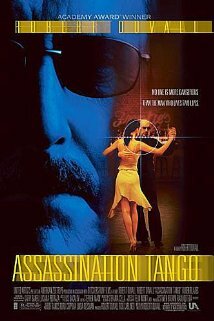 Assassination Tango was written and directed by Robert Duvall, clearly a labour of love. With his long and successful acting career, Robert Duval directed his first film The Apostle, in 1997, receiving critical acclaim for his performance and his direction. This time he is a semi-retired hitman, seemingly with little conscience about his work, but trying to reconstruct his life in New York City, an attachment to mother, Kathy Baker, and her young daughter, for whom he becomes a father-figure. However, he receives a call to go to Argentina and to assassinate a general who is responsible for the disappearance of a lot of Argentinian citizens. His being employed by a family who are seeking vengeance. The contact is played by Ruben Blades. However, the hitman is attracted by the music, the movement, the partnerships in the Tango, becomes involved with an instructor, learns the steps, enjoys the dancing, has a relationship with her. In the meantime, the target is hospitalised and so the hitman is delayed in Buenos Aires. However, the time comes when he uses his expertise in disguise, coming at his target from an unexpected angle, achieves his mission, and is able to get documents to return him to New York City and his “normal” life. 1. Robert Duvall, writing, directing, acting? 2. The credibility of the plot, international hitmen, conspiracies? 3. New York, the apartment, the family lifestyle? Buenos Aires and the contrast, the city and views, apartments, hotels, connections, homes? The target, his home? 4. The title, the Tango, John and his love for Tango, in New York, and in Buenos Aires, the lessons, performance? The dancers, the instructors, relationships? 5. The seeming normal background the John, his age, relationship with Maggie, little girl, the outings? Preparation for the birthday? His being a father figure? 6. The background in Argentina, the generals and their regime, disappearances? Murders? The atmosphere for vengeance? 7. John, his normal life, the connections, visits, the personnel, requests in New York, discussions, his reputation, past hits, arrangements to travel, the connections in Argentina? 8. Johny, arrival in Argentina, Miguel, the connection at the airport, meeting the family, the discussions, the plans? The impact of their history and losses? 9. The police, their investigations, tracking assassins? Arrests? 10. John, his stay, undercover, growing the beard, disguise? Making contacts with the family and his connections? Miguel, arrests torture? 11. The Tango, the encounter with the instructor, good connection, the lessons, the relationship, sexual relationship? Dancing? 12. His methods, clever, surveillance of the house from unexpected angles, waiting during the general’s illness? 13. The confrontation in the garden, the killing, the general’s wife? 14. Leaving Argentina, the connections, documents, the cover? Back to New York, normal, Maggie and the little girl?